Javea, otherwise known as Xabia, is a coastal town located between Cape La Nao and Cape San Antonio. There are three main parts to it; the old town with its white washed houses and narrow streets, the beaches and the port. Although the beaches are absolutely perfect for almost every water sport imaginable, there are also some wonderful historic sites to explore. Javea is sheltered by the Montgo which is the highest peak in the Montgo Nature Park. This whole area was first occupied 30,000 years ago by cave dwellers. Traces of the earliest inhabitants were found here which included human burial sites and cave paintings. By the 2nd century, Javea was occupied by the Romans making it the oldest Roman site on this part of the coastline. During the 6th century the Visigoth monks of the Christian faith settled here and built a monastery which no longer exists. The son of the Visgoth King sought refuge in the monastery after making the King angry by marrying a Christian. All but one monk fled, and the one remaining monk and the King’s son were killed. There are still several residents of Javea today who have Visigoth names. Javea was then occupied by the Arabs from 714AD until the beginning of the 17th century, and it was from the slopes of Montgo that the Moorish Caliph Abd-ar-Rahman III made the journey from Cordoba to collect hundreds of medicinal herbs. The old town used to be surrounded by a wall to protect the village from pirates. There were three gates that lead into the town. One of the main attractions is the 14th century Church of Sant Bartomeu which is a national monument. This is also where you will find the Atelier 1 Art Gallery and the Solar Blasco Archaeological and Ethnological Museum with temporary and permanent exhibits of the ancient artefacts found in this area. In more modern part of town is the Church of the Virgen de Loreto which is considered to be on a par with the stunning design of the Cathedral of Brasilia in Brazil and the Liverpool Cathedral in the UK. Down by the sea is a sandy beach area called the Arenal which is flanked by a promenade. Here you will find the Punta de l'Arenal which was an ancient fish factory the Romans developed to dry and salt their fish before shipping it out to the rest of the empire. The port’s history goes back to the 15th century, although the first jetty was built in the 1871 when it became an important port for the export of raisins. Unfortunately the raisin trade collapsed at the end of the 19th century, after which the settlement became a fishing port. Today you can still visit the Rui-Rau which were sheds built to protect grapes being exposed to the sun during the process of turning them into raisins. Or visit the Molins de Vent de la Plana (wheat mills) as wheat was another important crop during the 18th century. To the north of town is the San Antonio Cape Marine Nature Reserve. 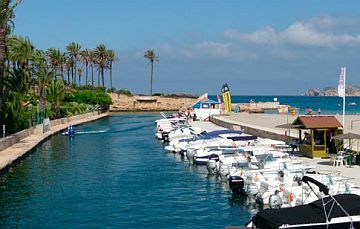 From the port you can hire boats or learn to sail by joining one of the classes available. South of the port is perfect for diving, and the more southern beaches are ideal for sunbathing and windsurfing. For a more unspoilt coastline, head for the area between the Cape of San Martin and the Cape of La Nao. Granadella Cove is particularly popular with beach goers as it has two diving clubs, golf, and plenty of bars and restaurants. If you are interested in exploring the coastline, there are numerous vantage points which will give you stunning views of the Mediterranean. This coastline was very much reliant on strategically placed towers for its protection, and one such tower is the Ambolo Tower that stands on top of a headland. The Tower Capsades has a collection of ancient artefacts that go back to the time when the Arabs were in power. Then there are the ruins of Granadella Castle to the southeast of Granadella Cove which was built in the early 18th century on top of the foundations of a 15th century tower. Despite its three foot thick walls, the English still managed to destroy it during the Napoleonic Wars. 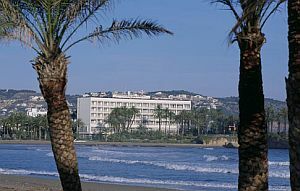 Javea has the distinction of having its very own Parador, the Parador Hotel Javea. The hotel is part of the Parador chain of luxury hotels with stunning views of the ocean from every bedroom. Surrounded by gorgeous landscape and palm trees, there is a seasonal swimming pool and superb restaurant. It is also only a two minute walk to the beach. In April the town holds its ever popular Craft Fair where craftsmen from all over the area demonstrate their skills, along with lots of food, dancing and live music. There is a particularly captivating event in August with a game of ‘living chess’. This famous game is reproduced using actors as chess pieces along with musical accompaniment. During the summer months there are several International music festivals as well as the San Juan Fire festival, and September hosts the Feast of Virgen de Loreto and the Feast of Moros y Cristianos. So no matter which time of year you choose to visit Javea there is bound to be something very special taking place.